Ignite provides a complete back and front office system for insurance businesses: prospect capture, new business, MTAs, cancellations, renewals, rating engine, document production, taking payment, buy online, and integrated accounts. Our brokers either use Ignite to manage their entire insurance business, or certain product lines within their business. Scroll down to see each module of the Ignite system, or contact us for an online walk-through demonstration. Ignite is an insurance software application delivered over the Internet, so there are no servers or size constraints. With cloud hosting Ignite Broker can be accessed anywhere in the world with the appropriate permissions! This makes it easy to run multiple sites, give read-only access to third parties, or even work from home. All Ignite clients exist on a single shared code base. This means that we upgrade all our clients at the same time, every month, and all users share in the benefits of system developments. Upgrades take place overnight in a matter of minutes without users even noticing. It also means that none of our clients are ever stuck on ‘old’ software. An impressive web presence gives customers coming to your website the confidence to buy. Ignite's quote & buy facility combines a beautiful question set with the ability to extensively customise the look and feel. Customers coming direct to your can get a quote, be shown a full premium breakdown, and buy online using a credit/debit card. The customer will be emailed all their documentation. Once customers have bought they are sent login details so they can return and retrieve their quote or policy documentation. Customers can also renew online or make amendments to their policy information. Ignite is integrated to most major UK aggregators across a number of product lines. We foster good relationships in order to grow our clients’ books. If you have a good product which fulfils a useful niche on an aggregator, we will help you get on that panel. Through our connections with aggregators we process over 5 million quotes per month. Ignite's Rating Engine is a fully configurable product that allows immediate, web-based access to your schemes. Rate changes normally take no more than a few hours to administer and promote to live. For our brokers, who want to make best use of their specialist knowledge in the business they write, control of rates is key to commercial success. Ignite aims to minimise staff involvement in run-of-the-mill administration. Rules defined by the business therefore govern all documentation, emails, calls, diary entries, and chase ups. Basic tasks – taking up a policy, making a change, or locating a customer – are quick and intuitive. Documents are system generated so there is no need for staff to type out letters. Workflows or the documents within them can be edited by a broker user so you have total control over your documents at all times. Inbound letters are scanned and attached to customer files to create a paperless office. Emails or PDFs from clients are simply drag-and-dropped into their correspondence area. When a client approaches renewal Ignite can be customised to either automatically send out a renewal invite, or list potential renewals in a dashboard for review. This cuts down on renewal processing times. For brokers using Ignite there is total control over commissions, fees and add-ons. Our admin pages are used to change the text of add-ons or documents, and amend in real time the pricing of add-ons, as well as commissions and fees. Pricing strategies can be defined by any number of factors, including premium range, insurer, source of business, even time of day. Ignite includes a Management Information dashboard that gives a graphical overview of the business. At a glance a business administrator can see a live view of the business performance in any of 50 given areas: from renewal retention to new business, from cancellations to quote-to-policy conversion rates. These can be filtered by date range, and also combine MI from multiple brands. In addition to the MI Dashboard Ignite's Reports Suite gives access to dozens of business process reports. These can be customised to collate data within date ranges, from certain schemes, or by business source. Bespoke reports can also be created according to specification. 90% of cases fit easily into the back office system. For the other 10% we use Dynamic Products. The Dynamic Products module allows you to build question sets and input pricing for policies that fall outside the norm. For example, products placed with a 3rd party, or new schemes that are on trial. With the Dynamic Products module you can create as many product types as you need. Once set up the user is able to note the details of a quote, relevant documentation, and then add premium, commission and fees. These will feed back into the Finance Module so that the nominal ledger stays accurate. For certain lines of business, especially B2B, a Quick Quote module is an excellent way mechanism for getting the customer an indicative price without filling in lots of details. Here is an example of a Quick Quote facility for wholesale telematics private car insurance. Brokers with access can answer 7 simple questions and get a price that is accurate to within 20%. They can then continue to a full quote if the price is right. If not, they haven't annoyed the customer or themselves in filling out the usual 60 questions. We use sliders, date pickers, and radio buttons to give a quick and intuitive quote process. If the customer wishes to proceed to a full quote the details they have already entered are carried forward into the full quote form. We use quick quote for products such as life, property, private car and even combine harvester insurance. Each quick quote function is built bespoke. Ignite has integrated with Applied Systems UK to gain access to their extensive, full-cycle EDI panel open market rates. This wide range of Polaris based schemes allows access to open market rates from Ageas, Allianz, Aviva, AXA, Chaucer, ERS, Europa, Highway/LV, KGM, Markerstudy, Covea, NIG, RSA, Sabre, Zenith, Zurich, and others. Modern businesses should never have to re-key. For that reason Ignite has a powerful Risk Importer that makes the upload of prospect or client data seamless. There is also the facility to use the Risk Importer in reverse and create easily formatted exports for risk data. Upgrading systems can often seem a daunting prospect. A valid concern is data migration, and the time and risk associated with it. Ignite has completed successful data migrations from SSP, CDL, TGSL and other insurance broking legacy systems. Our experience in this field makes the process streamlined and presents a useful opportunity to cleanse and re-engage with your data. Ignite integrates with over a dozen 3rd party systems in order to offer extra features and distribution channels. These integrations range from DVLA vehicle look-ups to Companies House, from payment portal providers to CRM tools. If you want to enrich your Ignite system with a bolt-on or look-up, we can help you achieve that. 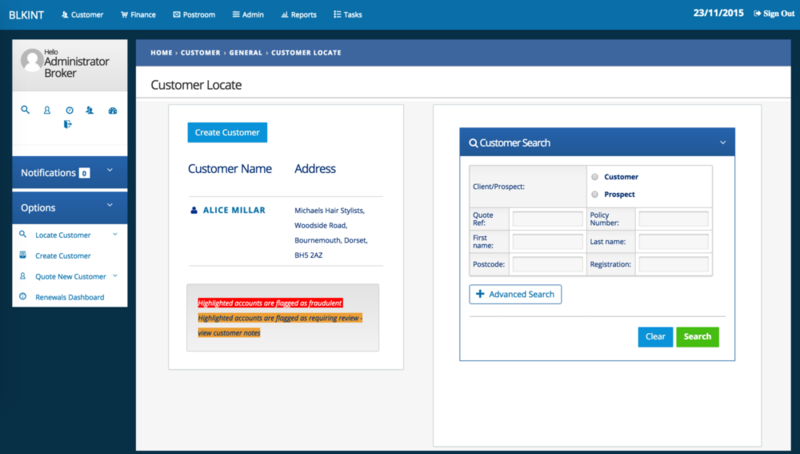 Within Ignite there is a fully customisable claims reporting toolkit. This allows claim information to be captured and stored against a policy/customer record. This useful reporting tool can be easily accessed by third party claims managers, or integrated into 3rd party claims systems. The information in the claims module can also be used to influence rating adjustments or flag up existing claims on renewal. Ignite contains an integrated finance module that is driven by the client record. When any transaction is processed this triggers a pre-defined set of Nominal Ledger posting rules. These can be fully customised by the business. 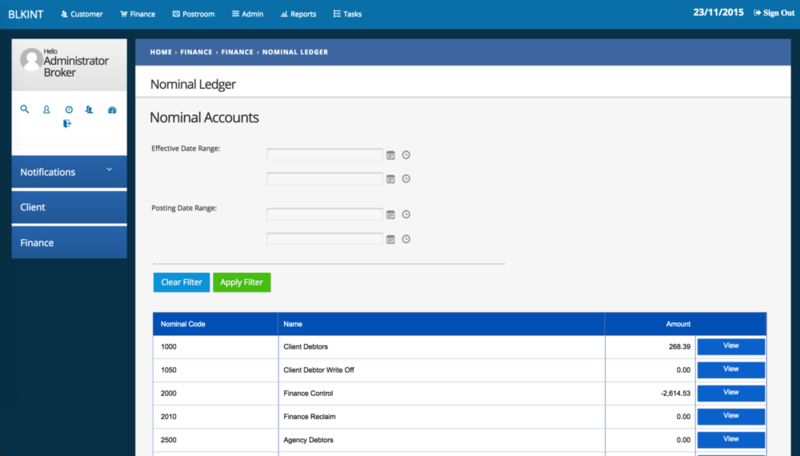 The finance system also includes the functionality to post to a Supplier Ledger, and an Agent Ledger. In this way the business can keep track of money owed to suppliers, and owed from sub-brokers or affiliates. Outputs from the Finance Module can be input directly into Sage, Xero or equivalent general ledger systems.